We had not ever cruised Disney before this trip, so there were so many unknowns and new things to experience and explore. We had an absolutely fantastic trip. 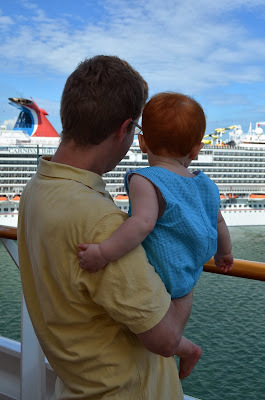 It was so nice to have a vacation with no email/work/contact with the outside world and just hang out as a family. 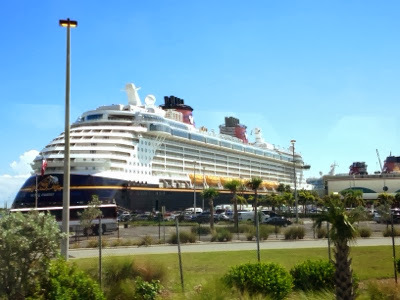 We took the Magical Express from the Animal Kingdom Lodge to the port. Doing so meant we didn't get on board as early as possible, but it took all the stress away. And the best part was the fact that they picked up our luggage inside our hotel room and we didn't see those four enormous bags again until they magically appeared outside our cruise cabin door that afternoon. Since we had some time to kill in the a.m. before the bus came at 11, we had a nice leisurely breakfast at the sit-down african restaurant in our resort, Boma. It was really good. The food was a pretty standard Disney style breakfast buffet, with more options and food than you could possibly eat. They also had a juice mixture concoction called "Jungle Juice" that was quite tasty. We filled up since we knew it would probably be mid-afternoon before we could get settled on the ship and get lunch. 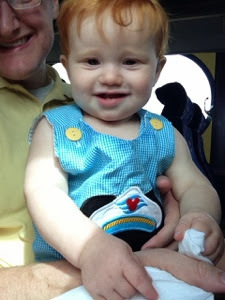 Disney Cruise Line buses picked us up about 11 and we were off to the port. 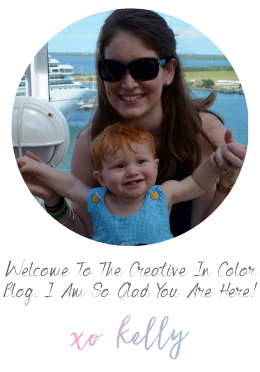 It is so exciting to pull up to port and see your home for the next week! Embarkment went really smoothly with very little waiting. Before we knew it we were on board. Our cabin was not ready until 1:30 so we killed time by eating some lunch up in Cabanas (quick-service buffet on the pool deck). 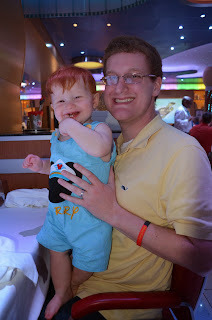 I also made a mad dash to the specialty restaurants to book a brunch at Palo for Andrew and I, which were sold out online before we (first-time disney cruisers = low man on the totem pole) could book. Success. As soon as the clock struck 1:30, we were off to check out our room. It was great! The area where the coffee table is was the perfect place for Perry's pack-and-play. And the curtain came across and divided P's area from ours so we could watch TV, get ready, etc without waking him up during naps/bed. Perry was a fan of our new digs for the week. 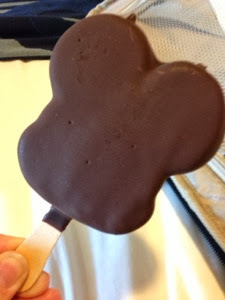 The first order of business once in our room was to order the first of many Mickey ice cream bars from room service. The classic snack that will run $3.75 in the theme parks is totally free via room service on the boat (plus a tip for the ice cream courier). Yummy! 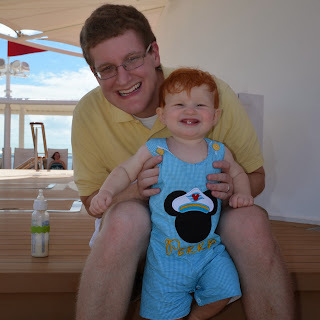 Then we went to explore the pool decks and give Perry a bottle. 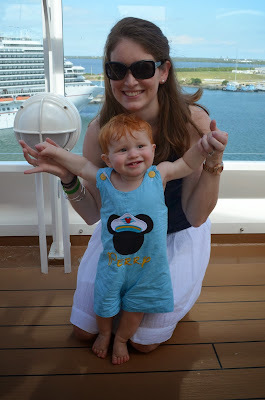 We had a planned meet up with a bunch of folks we have gotten to know over the past year on our cruise's facebook page. 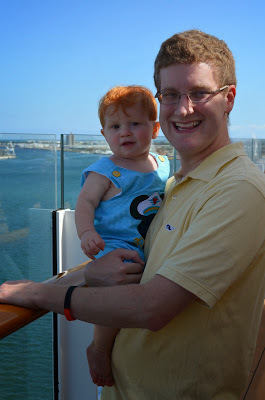 It was really cool to get on a boat and recognize and know (virtually atleast) a couple hundred people. 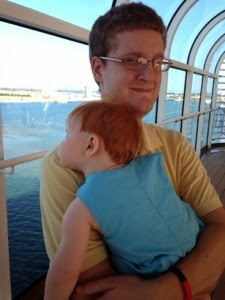 P eventually had had enough excitement and passed out on Daddy's shoulder and slept through the Sail Away Party. 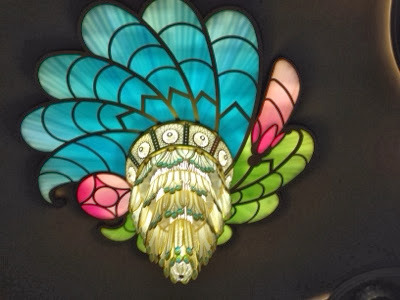 This is the chandelier that hangs in the atrium of the ship, with a subtle nod to the peacock. Like most cruises, the food is amazing, in both quality and quantity. Disney does things a little different from other cruise lines we have been on in that there are three main restaurants you rotate through, but your table-mates and servers travel with you. It is really pretty cool. 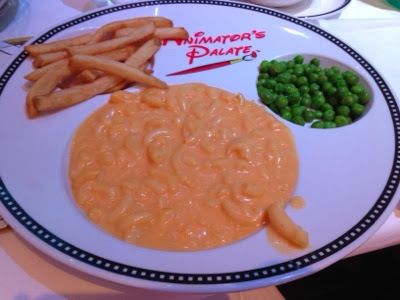 We specifically requested the rotation that started in Animator's Palate (so we would eat there 3 times instead of 2). Each restaurant has its own unique atmosphere and decor...it really breaks up the monotony you might get eating in the same place 7 nights. Here is a picture of our table in Animator's Palate (post-meal). Notice the two highchairs...one on each side of the table. We got to eat dinner each night with a sweet family from North Carolina, who had an 11 month old little girl. It was awesome to get to know them and the kids loved getting to interact with each other across the table. I hope we will stay in touch long even know that the cruise is over. Characters were everywhere aboard the Fantasy. Pretty much any given time of the day you could find a character somewhere or another. Day one we ran into Goofy after dinner. And Perry got to get his wiggles out crawling around the atrium. This was Perry's first real "kids meal" of mac and cheese, peas and fries. 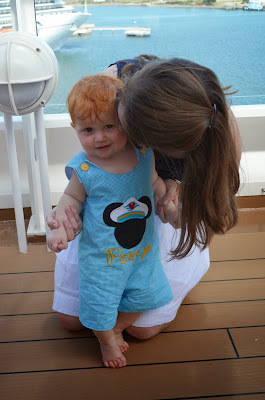 He also ate a lot of bananas, sweet potatoes, beans, yogurt, applesauce, oatmeal, etc on the boat. 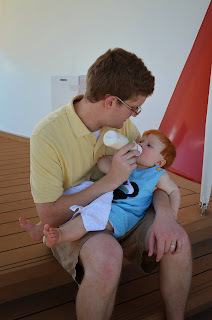 We took some of our own baby foods from home and used them some...but found things on the boat for him to eat most of the time. Our incredibly social baby mostly preferred to play with his food and pay more attention to all the people around him than actually eat. 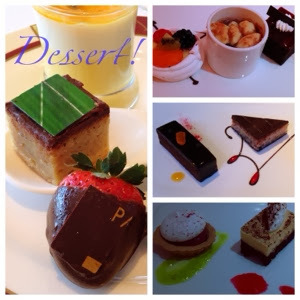 Oh the desserts. They were everywhere. And they were amazing.